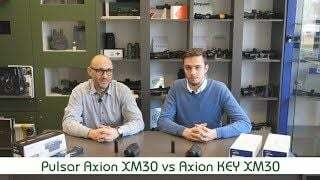 There are two basic differentiation of the Axion units – models which have an acronym „Key“ in their name and models without one. Models with a „Key“ acronym don't have a Wi-Fi and video recording software integrated into its construction while the units without the „Key“ have this software available for use. 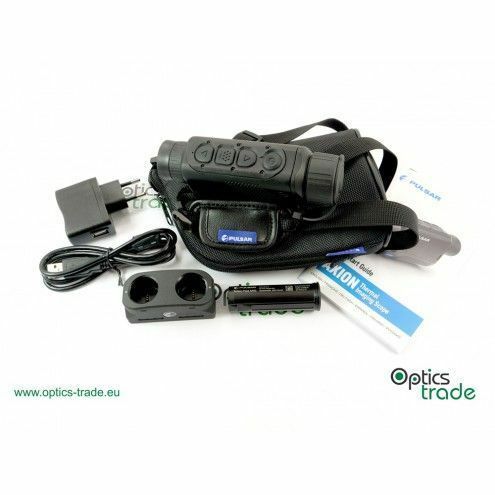 Pulsar Axions are remarkably lightweight and compact pocket-sized thermal monocular units which were released at the start of 2019 as a substitute for the Quantum Lite models which were discontinued in 2019. Every Axion model out there has three calibration modes (automatic, semi-automatic, manual) like the Helion units. Axion XM has an enviable 16 GB of internal memory for a purpose of storing images and videos. When it comes to a display, Axions are available with an LCOS – 960x720 and a brand new HD AMOLED 1024x768 microdisplay. LCOS display is integrated into the Key XM models, while AMOLED is built in the XM units which lack the Key acronym. The HD AMOLED display is designed to face freezing temperatures all the way up to -25°C while LCOS display can stand up to -10°C. The Key XM30 model has a picture in picture 2.5-10x digital zoom and 2x optical magnification. With this model, a maximum observation distance for an animal, such as a deer is 1200 m. The field of view is 10.3 m/100 m which means that this model is more appropriate to use on longer distances. Angular field of view of the Key XM30 unit is 7.8°. If your sole purpose is to observe an object without a need of taking pictures or videos then this unit (Key XM30) is the one you are looking for. The manufacturer offers 3 years of warranty for this product.